in-context editing makes a lot of sense when you're working on some content that's already live. Sometimes you're looking for an authoring experience that is less about editing and more about writing. That's what Composer is for. Composer provides a centralized interface for creating new content. Any page type can be setup to work with Composer. As you write in composer your drafts are automatically saved as you go, and you can choose when and where to publish later - just like a blog! To learn more about how to set up and configure Composer, check out this how-to article. 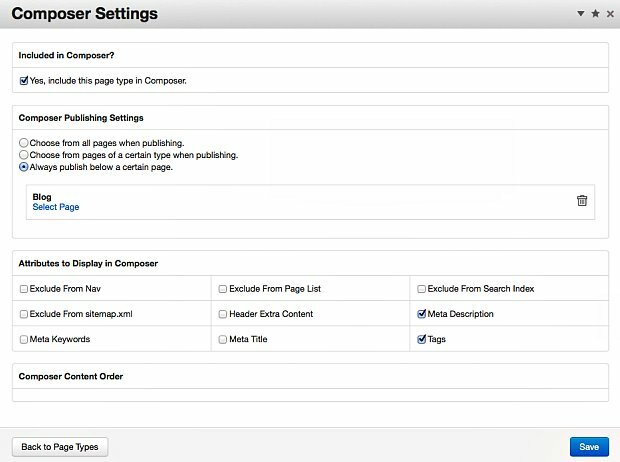 Note: If you installed without sample content (or without a starting point), you will need to set up a page type for composer. Click on the Composer button to the far right. This opens the Compser Settings and you can select to include the selected page type in Composer.